As soon as Wembley moves to the cabinet to climb up and towards the ceiling portal, an alarm sounds loudly and the portals to the room all turn red. Suddenly, four metal men appear. They look like iron statues only they are moving towards you with metal fists raise. 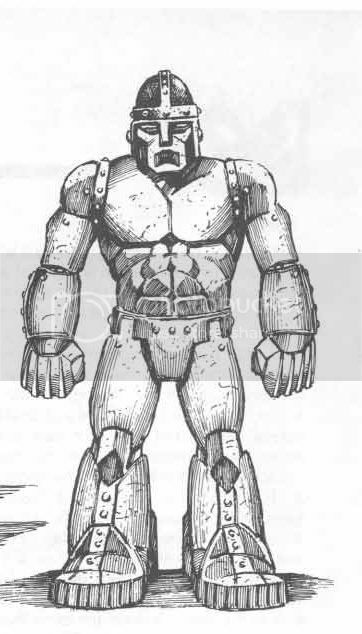 This reminds you of the fabled Iron Golems except these Iron men are only 3 feet tall. Still, they are moving towards you from the portals to attack. Posted on 2014-12-20 at 12:45:16. Despite being put to sleep and waking up in a different room, Angela managed quite well to adjust and once she started watching the vid of her explaining life as she knew herself, the rest of the crew calmed down and Grace was able to put in her 108 digit code to unlock the ship's computer and navigation. The statement was not lost on any member of the crew. A simple recognition but for Angela, this was a huge step even if she did not realize it. but there were pressing matters that had to be attended to and they could not be put off. Stephanie asked Catie for assistance to get blood samples from all the crew and take samples of the remaining steak as well. She wanted to know what hit them and how. The passengers were coming to now and were equally upset at being drugged. JC searched the ship (along with the Brothers and Seth if he is willing to have their help). Asante was not on board but a space suit was missing from the lockers and the upper hatch near the shuttle had been opened about an half hour after you all were drugged. All her personal possessions were left behind except a make kit and clutch bag (based on JC memory of the contents). Searching the contents, you find that many of her shoes had break away heels with devices hidden within. As well, her bag had a hidden bottom with several compartments, now all empty. Tess confirms that a signal was sent during your down time from a device in the ship. It was not long and most likely Asante signalling her ship. Stephanie and Catie worked their samples in the lab and discovered a number of things. The drug in the steak is a designer one that is similar to Byphodine that slows the metabolic rate to the point of seeming dead. This one was genetically enhanced to work quickly and not as deeply. Catie Stephanie theorize that this is why Angela might have remembered something because it doesn't induce sleep patterns but keeps the mind on a "standby" mode. The drug was activated by heat so even if you checked the steaks before, chances are you would not have caught it. Grace made a discovery in the engine room though. The panel door to one of the electrical panel was not closed properly. It had a bad latch but Grace was so used to pulling it up and closing that she did not replace it, but she never left it open and it was now. Once she investigated, she found a small device like the tracker you had found before but this was a small explosive with a timer set for 24 hours. Had it blown, it would have meant stopping to rewire the system which would have delayed you. Posted on 2014-12-20 at 12:39:26.
yes Angela remembered Grace and spoke her name. I approved that interaction. Posted on 2014-12-20 at 11:05:16. This Sunday marks 9 years of Rocinante flyin'. Three completed adventures and moving on to the fourth. Two original players are still with us and four of you have been there since the first adventure. Thanks for making this game so great. Posted on 2014-12-19 at 08:54:41. Details will follow. The spaceport is to the top of the map, about 1/4 mile away. Posted on 2014-12-19 at 08:24:47. 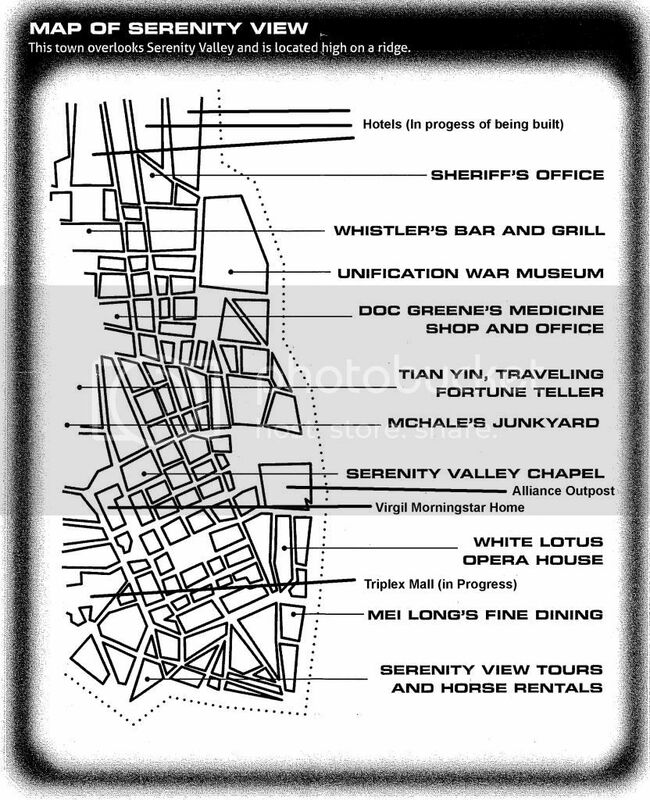 I am going to assume you will look on the cortex for a map of Serenity Views and the location of Morningstar. Just to get the map posted and the chance for you to decide who is going to talk to him and who is doing other things. Posted on 2014-12-19 at 07:54:07. I had hoped to update DF this week but christmas stuff sorta grabbed my time and ran away with it. Will post this weekend getting you to the cruise liner. After that it is Fifth Element meets The Sting. Posted on 2014-12-19 at 07:52:15. Posted on 2014-12-18 at 07:48:00. Posted on 2014-12-17 at 18:38:06. This is what I get on my spreadsheet. Posted on 2014-12-17 at 10:12:09. Have you updated the first page because the numbers do not add up at the moment? Posted on 2014-12-16 at 11:26:56. We love the lurkers. Glad you are enjoying the show. Up next, we discover who runs the fastest and who is too slow. Posted on 2014-12-15 at 08:58:15. 10 right going into tonight's game? Wow. The dice were good to me. Posted on 2014-12-15 at 08:03:09.
fantastic post Bro. Thank you. Posted on 2014-12-15 at 04:56:10.
well if the brave knight wishes to use his great strength to hold the monster up, feel free to try. Posted on 2014-12-14 at 11:20:23. Posted on 2014-12-14 at 10:43:34. Those with leeches are in pain as the little buggers tear through flesh and the venom works into your system. Maximus and Jarenion almost lose consciousness again but fight to maintain control. Odyson changes into the Great Bear and the tentacle slides downwards slightly due to the change in weight. The bear tears into the flesh with his free claw and bites the rubbery flesh although spitting it out as to not ingest the foul creature. The change forces the leeches free of the Cleric's body and the appendage holding him is no match for the beast. The Bear is released and drops to the ground, aided by the feather fall spell on the bead he wears. Maximus throws his axes at the arm holding Odyson and hits with such might as to cleave it free of the body. Leeches and black blood spray out from the wound but far enough away as to not get another party member. Lun casts a cure spell on Arien and the health flows back into the knight. Arien draws his bow and open fire upon the arms attacking. He clusters his attacks upon one tentacle and it slowly becomes limp and inert from the wounds. Sparrow and Kadrin also attack and put down an arm each with their attacks. Finarsil casts cure disease upon herself is rewards with the end of the creatures burrowing into her. The remaining tentacles move to try and grab a victim, but you are all now way of them and manage to avoid being grabbed. But as they attack, more tentacles, either new or renewed come through the cavern ceiling. The party keeps on the attack as Jarenion releases his spell and fires off a fireball towards the creature above. The spell goes off way above you and explodes. The fireball burns the flesh of the tentacles and they are consumed. The rock above you shake and start to crack as the creature within writhes in the pain of the flame. Rocks start to fall away reveal a massive creature above you, one that filles the entire space above this cavern. More rocks fall and the black rubbery flesh starts to slide through the bigger cracks. Whatever it is, it is about to come crashing down. Posted on 2014-12-13 at 13:14:15. The hobgoblins were dead but not for long. They had been here less than a day you'd figure. They also show signs of starvation as they are thin and gaunt. They have no weapons on then and their leather armour reeks of dead and hobgoblin sweat. Wembley looks over the cabinet in the corner and cannot see anything that shows itself as a exit as the map says. The other cabinets are much more interesting than this one which contains nothing. Yes as he stands there looking, he notices something. The ceiling above is very dark, almost painted black but to his fine Cidal eyes, there is a black square above the display cabinet in the roof. One that does not show heat nor cold. It is a portal, like the others but in the ceiling. Had he not known to look for it, he would have missed it completely. Posted on 2014-12-13 at 12:38:15. The basic move is to get closer for combat--i.e., move close enough to an enemy to attack. This is neither a blind rush nor a casual stroll. Instead, the character approaches quickly but with caution. When closing for combat, a character can move up to half his allowed distance and still make a melee attack. Posted on 2014-12-13 at 12:29:40. I can advance the story with what I got but it will be small post. Posted on 2014-12-12 at 12:11:20. Posted on 2014-12-12 at 09:02:48. I will be posting this weekend and taking up forward a few days. At that point i probably will not post again until the new year unless you have direct playable questions or you all post rapidly as a christmas present to me. Posted on 2014-12-11 at 07:34:22. If I can get a quorum of posting in before the weekend, i will post the game further along. After that I will probably not post again until the new year but please make sure you do post so we can start up asap. Posted on 2014-12-11 at 07:31:53. You can only do a single action in a combat round. So you can change or cast spells. If you really want to try both, pick one you do well and the other you will do really poorly. With the coming holidays, I would like to get this combat atleast one more round further if not done before we stop until the new year. Posted on 2014-12-11 at 07:30:07. With the holiday season coming, and the usual pace of this game, I do not see myself posting again until the new year unless direct questions are asked that I can answer in gamesplay or you all post rapidly. So please do post between now and new year and we can start the game moving then. You basically need to find Morningstar, make contact and work from there. Posted on 2014-12-11 at 07:27:39.